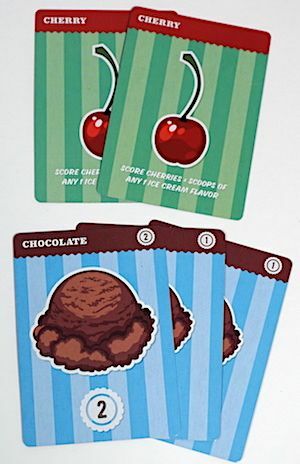 Nate Bivins designed Sundae Split, an I-split-you-choose game published by Foxtrot Games and Renegade Game Studios. One player each round is the “splitter”. They draw cards (variable depending on the number of players) from the deck. After looking at all the cards, they distribute them among piles, one for each player. The piles do not need to be even, but there must be at least one card in each pile. The splitter must also place a specific number of the cards face-down, allowing them to be sneaky about what each pile truly contains. Once all the cards have been placed, each other player chooses a pile, immediately revealing any face-down cards as they are chosen. The splitter receives the last pile, and the remaining deck is passed to the new splitter. 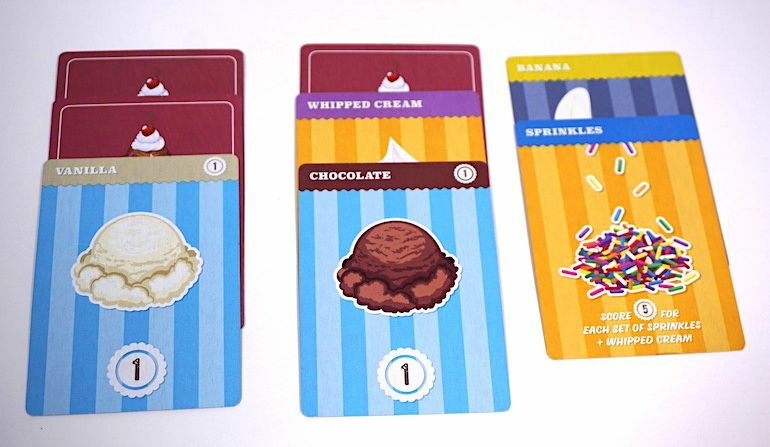 As they receive cards, players sort them by type, showing the contents of their sundae as it is built. When no cards remain in the deck, the game is over and scoring begins. Scoops of ice cream are worth face-value, plus additional points for “variety” (sets of 3 different flavors). Cherries act as a multiplier (# of cherries X # scoops of one flavor). 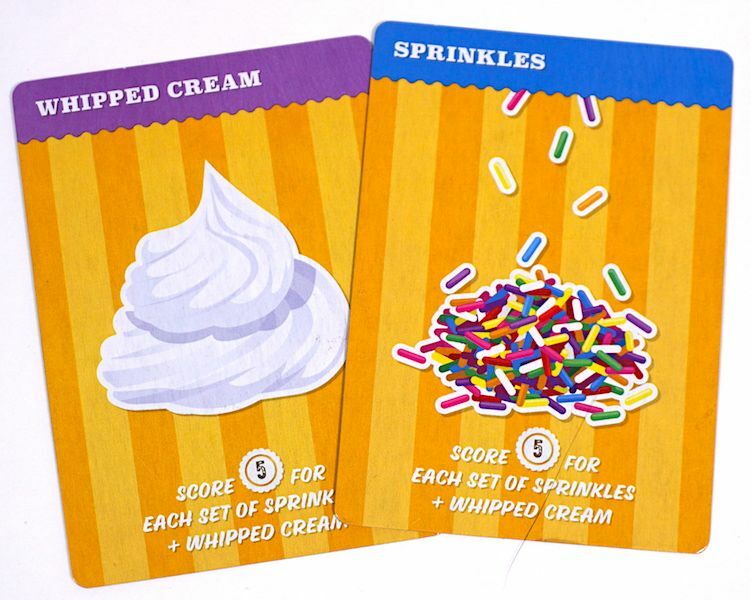 Sets of sprinkles and whipped cream cards will award 5 points, and players accumulating the most bananas are awarded a large bonus. These don’t belong in my sundae! Of course, there are also vegetables that somehow sneaked into your sundae! Vegetables subtract points from your total. At the end of the game, the player with the most delicious sundae (most points) wins! 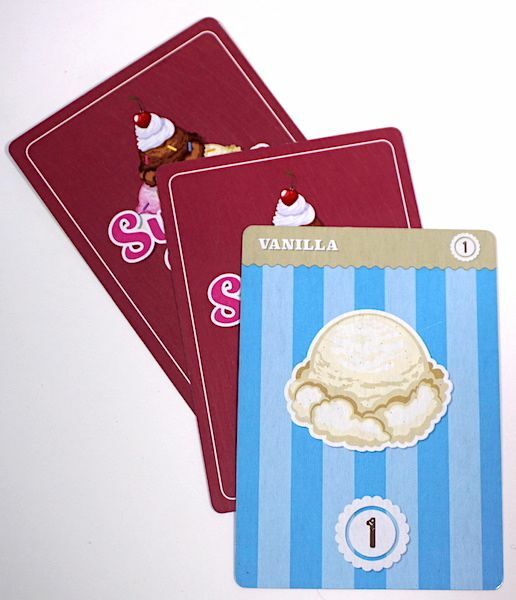 Sundae Split is a good introduction to split-and-choose games. 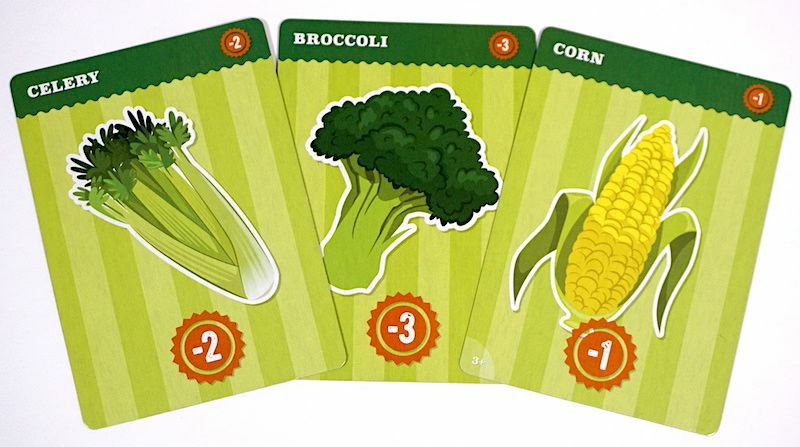 The splitter has a very clear job each round, and the other players are left to wonder if the face-down cards hold vegetables or bonuses. 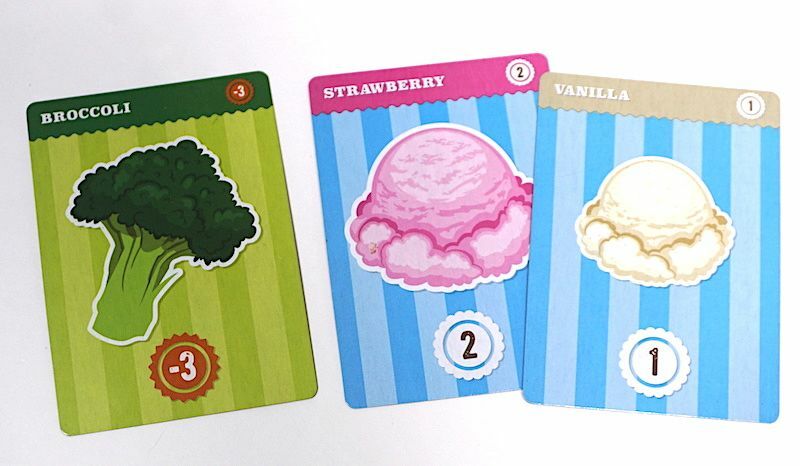 Most of the cards are good, but every round encourages calculation to choose the best ingredients for your sundae. The cards are cartoony, with a striped background reminiscent of a soda shoppe. The art probably won’t make your mouth water, but at least it’s very clear. 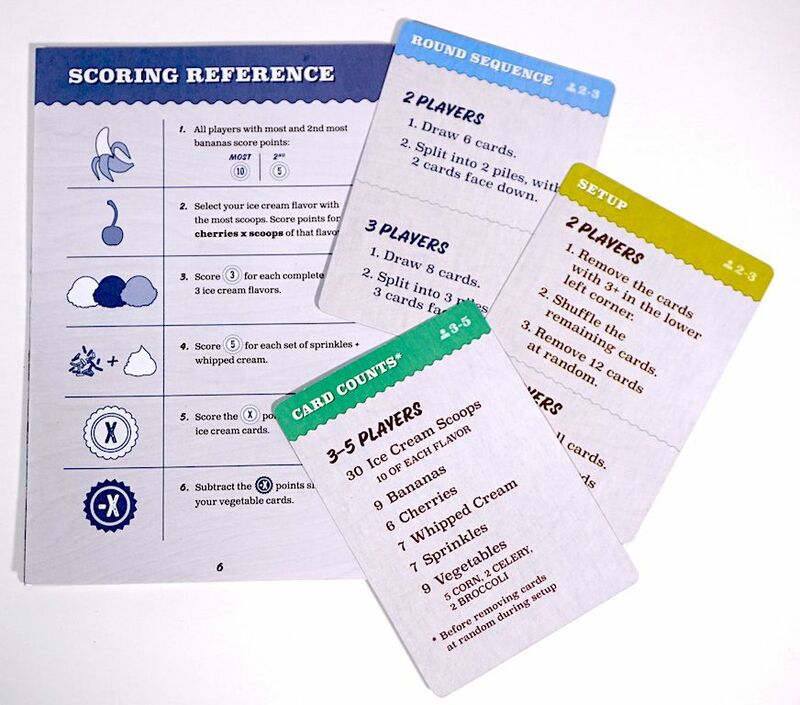 There are three quick reference cards to help with setup, and a large scoring reference sheet on the back of the instructions. Quick and easy to start a game at any player count. Claire (age 9): I like the whipped cream + sprinkles combination to get points. And I like the idea that the cherry is a multiplier. Asher (age 7): When you’re the splitter, it feels like you are making real sundaes for the other players. And all the bad stuff, you want to hide in the center so they don’t know it’s bad. Elliot (age 4): You’re making ice cream for all the people in this country. Sundae Split doesn’t have much depth, but it has consistently been a winner with our kids. Maybe it’s the fun food theme, or maybe it’s the thrill of building the piles and the tension of what will be chosen. They always think it’s hilarious to force someone else to take celery or broccoli. As noted above, even our 4-year-old plays, although he doesn’t understand the scoring. Scoring all the different items feels complex. Our kids didn’t get it at first, but it didn’t take too long for the older ones to get the hang of it. With all the adding and multiplication (of relatively small numbers), Sundae Split is a great way to keep arithmetic skills sharp over summer vacation. Pick up Sundae Split at Amazon or at your local game store. At $15 or less, it’s a tasty sample of the world of split-and-choose games. 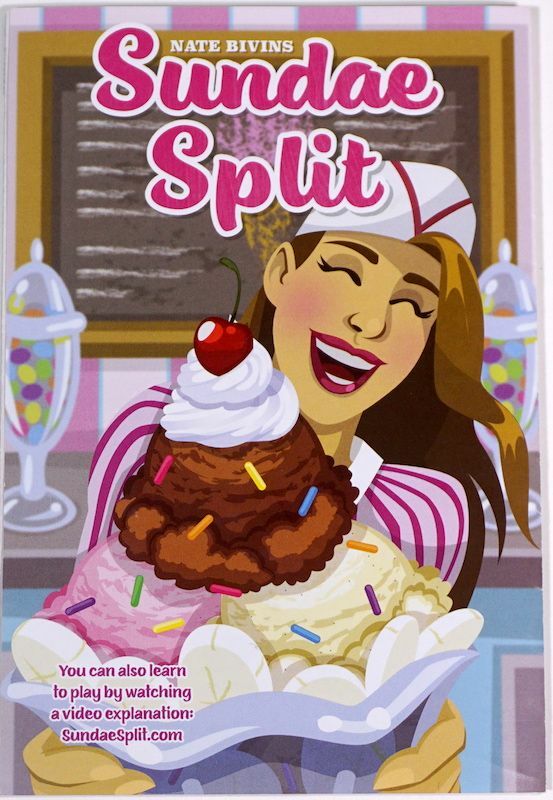 The Family Gamers received a review copy of Sundae Split from Renegade Game Studios. Yummy game ^^ Going to buy a few chocolates :D Thank you for Review!